Here at three squabbling asians, we have a rule that we cannot start talking about our Thanksgiving menu until October. This year however, due to my extreme gestational state, Little Miss and Yuan were left in limbo while I fretted about how I may have to spend my favorite holiday of the year eating hospital food turkey. As my early November due date came and went with no indication that someone had any intention of leaving the womb, I called Little Miss and Yuan to tell them that I would have have to skip Thanksgiving unless I evicted a tiny person in the next 24 hours. Thankfully, occupy my belly ended less than 24 hours later. Just in time for me to go home and have my fellow squabbling asians come up to Davis to cook me a Thanksgiving feast! Little Miss was highly organized as usual and whipped up our usual Thanksgiving menu items. Because of the last minute planning, Thanksgiving was a cozy family affair this year and we pared down our menu a bit and added some flair to our usual items. I was still incapacitated but my mom filled in for me and I contributed by sitting on the couch and eating. To celebrate my ability to eat whatever I wanted for the first time in almost a year, Yuan brought up sweetwater and Kumamoto Hog Island oysters. Oh how I missed that briny, succulent, raw oyster! They were absolutely delicious. This year, Mr. Turkey was a 15 lb pre-brined bird that Yuan rubbed with herbs and truffle butter and roasted. He did not flip the bird this time during the cooking process, but Mr. Turkey came out very tender and juicy. Here he is in all his glory…and Little Miss picking at him. My mom made our usual stuffing with sausage, shitake mushrooms, celery, onion, rosemary bread, water chestnuts, and the magical powder that makes everything taste like Thanksgiving, otherwise known as Bell’s Poultry Seasoning. 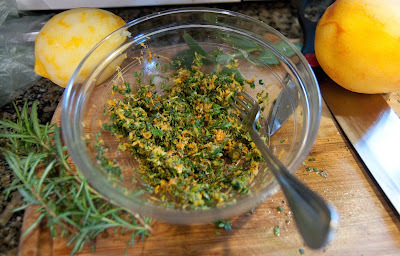 I know turkey snobs insist that cooking the stuffing in the turkey dries it out, but the stuffing does not taste the same unless it is cooked in the turkey with all the juices! We stuffed half of the stuffing in Mr. Turkey, then scooped it out into baking dishes when Mr. Turkey was done and finished the stuffing in the oven. By cooking the stuffing again after it comes out of the turkey, we ensure that both the turkey and stuffing are cooked just right. Here we are, inspecting Mr. Turkey for hidden stuffing bits. 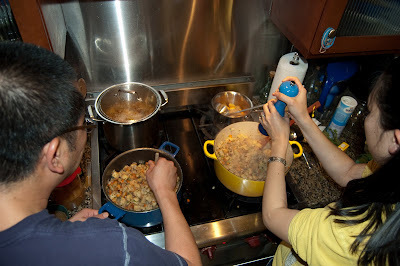 We also had Molly’s cranberry relish and green bean casserole and Yuan made a classic gravy. For sweet potatoes, Little Miss made her mom’s recipe with bacon and cheddar cheese which sounded strange and mid-Western (much like Little Miss) but was a great sweet savory combination. Bjorn made a butternut squash bisque with homemade croutons which was also really delicious. 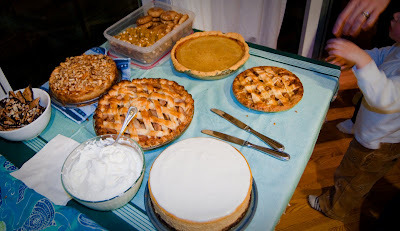 For dessert, we resisted the urge to have half a pie per person and limited it to pumpkin and apple staples. Little Miss made pumpkin cheesecake which she modified this year by making a half portion of the filling and making it in a shallower pie dish. 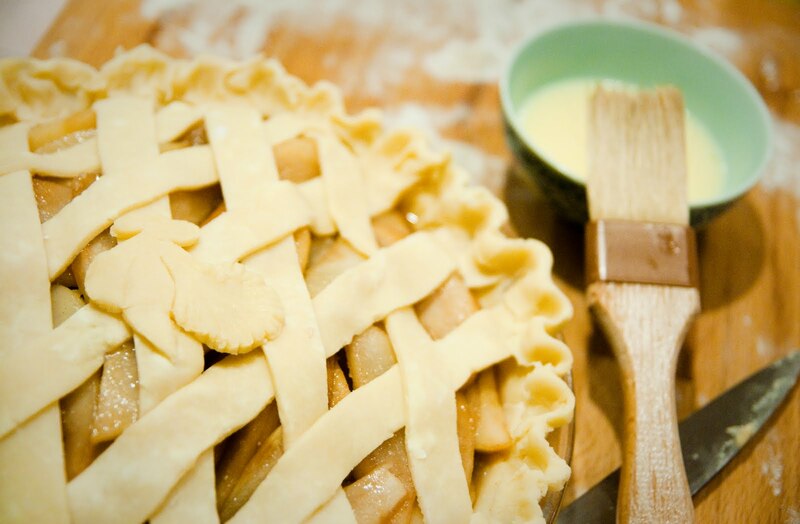 We found that it was easier to bake properly and resulted in a better crust to filling proportion. She also made a yummy apple cheese torte. My mom’s Thanksgiving day plate. Many thanks to Little Miss and Yuan who came up and prepared a feast for me, Bjorn, my mom, and my new little man. Next year little man, you too can enjoy some Thanksgiving grub. Another year, another turkey day!! This year, we had a mix of old friends and family out in Davis for a super cozy holiday. We had nine people sleeping in our tiny house, including my in-laws, who along with Adam, provided us with lots of wine, and Little Miss’s baby brother, who is far from a baby. Yuan was relegated to the unfinished basement. Well, he volunteered I suspect because he was afraid that I would draw on him while he was asleep. Thanksgiving is a well-oiled machine of sorts, as long as we don’t get distracted or have too much wine early in the day. Little Miss declared that we did not need to menu plan and after some coordination on the shopping list and turkey transport, Yuan, Little Miss and I threw together a holiday feast. 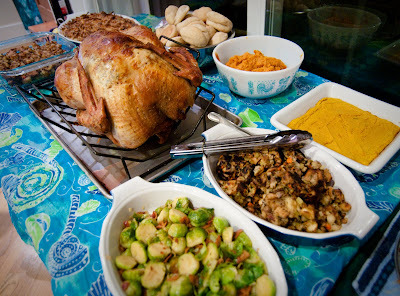 We have become somewhat set in our ways as our must-haves (mashed potatoes, green bean casserole, brussel sprouts with bacon, sausage stuffing, and turkey) have taken over the menu, making it hard for us to add new items. Little Miss came out on Tuesday and we spent a day making desserts. This year, we revisited the pumpkin cheesecake, tried the Normandy apple tart recipe from Dorie Greenspan’s Baking book, and made a pecan pie. We had never tried the pecan pie, and the results were semi successful – how does one not burn the crust?!? Tasted yummy though. This year, my cousin Nozomi, who goes to college on the east coast, came out for Thanksgiving. 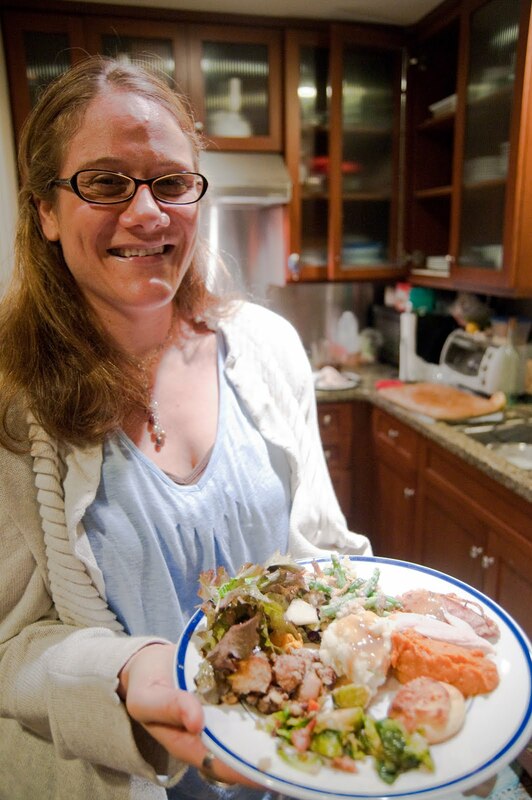 Having grown up in Japan, she was deprived of Thanksgiving for the first fifteen years of her life and ever since first experiencing this wonderous food holiday seven years ago, it is her favorite! Which is not surprising since we are related and she too loves food – she can eat an entire fish down to the bone, eyeballs and all. This was also her first trip to California and she kept asking me if we could go see the “Full House bridge!” Nozo inexplicably loves tiny marshmallows, and as soon as she arrived she demanded we make that “orange marshmellow thing,” so we did. They later worked it out and looked and tasted amazing on the table. Yuan made a sauteed mushroom medley that Adam couldn’t keep his grubby fingers out of. Nozo’s Thanksgiving dinner plate. And yes, she ate ALL of it. And while I never got a chance to sharpee Yuan, I did manage to give him a gorgeous sparkly hot pink pedicure while he was in a wine stupor on the floor. Sooo pretty! And Nozo got to visit her “Full House” bridge. Thanksgiving is like the foodie Superbowl – so much, in fact, that at one point I demanded to know why Puppy Bowl wasn’t on. It is the single biggest food day of the year, and if you’re doing it right the very purpose of the day is The Meal. 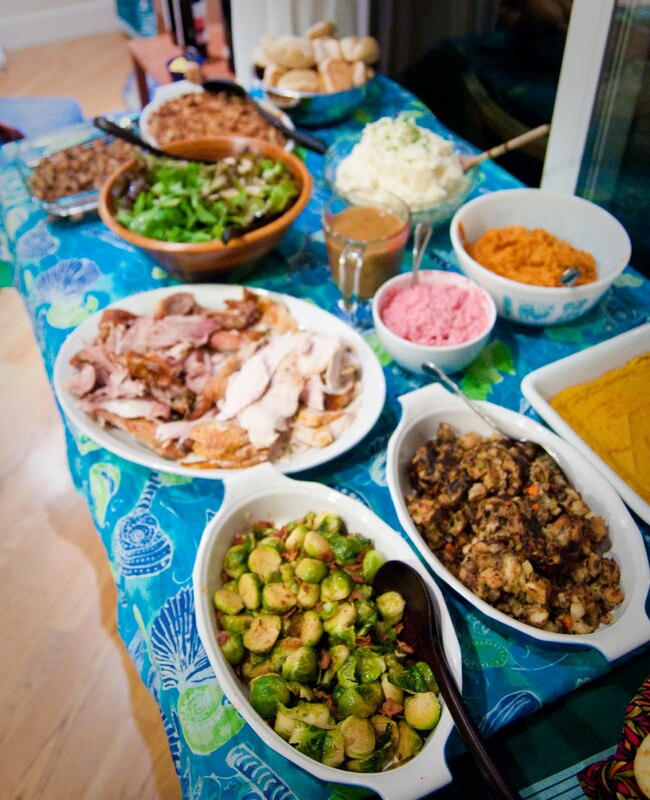 Glorious and damning all at the same time, the traditional Thanksgiving dinner is not only problematic because it is dedicated to the celebration of plenty, but also because it comes with so many scrumptious non-negotiables. You have to have turkey, duh, and of course gravy, stuffing and mashed potatoes. You also have to have cranberries, and green bean casserole and brussels sprouts. And then you look at the menu and think, crap, maybe we better have something fresh, and doesn’t involve dairy fat. So you add a salad. And then you think well god, this is the same stuff we make every year, we really have to make some new things too. Pretty soon you’ve added the Noah’s Ark of carbs (two of every kind), vegetables spanning the fall rainbow, and no fewer than three desserts, plus toffee for snacking…. Then your guests call and offer to bring further irresistible temptations like apple cheese torte and snickerdoodles. And by this time you’ve pretty much passed the point of no return. You’ve plunged headlong into an absurdly overindulgent world in which a ratio of half a dessert per person is not only reasonable, but a little on the conservative side. Thank god there’s a whole weekend and the James Bond marathon to recover from all this holiday. 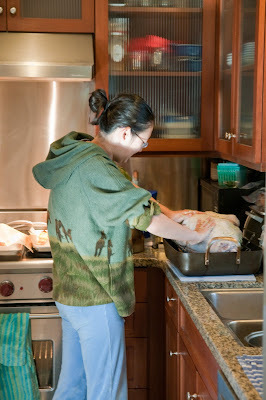 Yuan did a nice job carving Mr. Turkey. He was tender and juicy. The turkey, not Yuan. Our traditional Thanksgiving feast for twelve consisted of sausage stuffing, brussel sprouts with bacon, carrot souffle, sweet potatoes, garlic mashed potatoes with marscapone, cranberry horseradish relish, gravy, fall salad with pomegranates and pears, green bean casserole, and whole wheat dinner rolls. Our guests included college, Hawaii and Davis friends. Stacey is thankful for her Thanksgiving plate. Little Lane knew where to find the good stuff. Dessert table!! Dessert was truly a communal effort. Almond Toffee, Apple Almond Cheese Torte, Snickerdoodles, Pumpkin White Chocolate Macadamia Cookies, Pumpkin Pie, Apple Pie, Cranberry Peach Pie, Pumpkin Cheesecake with Marshmallow Topping and Whipped Cream. Oh and three different kinds of ice cream including homemade white chocolate ice cream. In preparation for the eating holiday of the year, my fellow squabbling asians drove out to Davis to prepare for the feast. Yuan made some delicious turkey stock with roasted turkey wings and necks, onions, carrots, celery, bay leaf, salt and peppercorns. 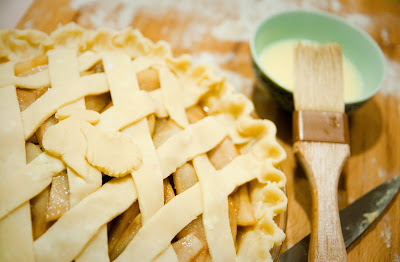 Little Miss did a wonderful lattice on her festive cranberry pear pie and Yuan and I had a stuffing making contest. … and rubbed all over Mr. T before he went into the oven breast side down at 425 degrees for a hour. We then flipped him over, lowered the heat to 350 degrees and he cooked for another two and a half hours.